Oliver Jentsch (left) and Toyota driver Lewis Bates. Damesa Industries have thrown their full support behind Lewis Bates as a personal sponsor for the 2019 season and beyond. 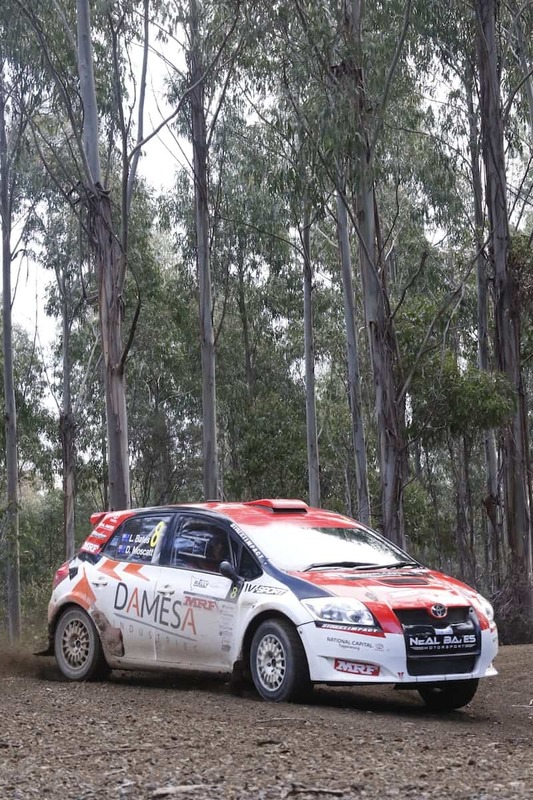 “I fully understand the value of Toyota Gazoo Racing Australia backing Neal Bates Motorsport to make sure the team, Lewis and Harry have the best opportunity to be more than a threat in the Australian Rally Championship over the coming years,” Oliver Jentsch from Damesa Industries said. “We have supported Lewis for the past two seasons in two different cars (Corolla and the Corolla S2000) and were amazed at the level of professionalism and adaptability Lewis and the NBM team have shown. “Make no mistake, we think Lewis Bates has talent and it is encouraging to support this young driver so early in his rally career. “We are passionate about rallying and urge any other potential sponsors to get involved and assist other young drivers out there that may find it difficult just getting to an event. It can very rewarding” Oliver added. Based in Queanbeyan, Damesa Industries are providers of quality hardware and fasteners.